Avoiding the segregation of feed ingredients during process of mixing, people use pelleting process to increase gelatinization and digestibility of feed so that fish is more apt to receive a totally mixed nutrition. Just as its name implies, fish feed pelleting refers to the process of compressing, pelleting and molding feed ingredients into the shape of pellets under the action of the heat, moisture and pressure. Pelleted and extruded feed produced by fish feed pellet mill and extruder have become the mainstream feed for most fish because of its high digestibility, abundant nutrition and floating properties. Why Pelleting the Feed Ingredients? The purpose of pelleting is to make fish feed pellets with healthy nutrition and delicious taste for fish by high heat, moisture and pressing, replacing the dusty, unpalatable and difficult-to-handle feed material. Fish feed pellets produced by our pellet mill have homogenous nutritional value after the uniform mixture and extrusion process, increasing gelatinization and digestibility of feed pellet, so that each fish can absorb well-balanced diet, also saving feed pellets and lowering the fish farming cost. After pelleting, feed pellets would be less influenced by moisture, oxidation and other external factors. 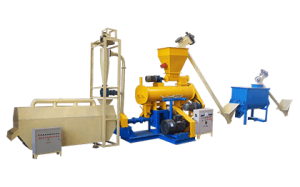 It is easier and more convenient to handle, transfer and store the pelleted fish feed. The most important feature of the pellet is durability, crushing strength and water-resistance, feed pelleted through our machine can float on water surface long for 12 hours. Adopting pelleting process can kill pathogenic bacteria and reduce the occurrence of fish disease. Pellets would be processed under the high temperature up to 70-100 Celsius, which can kill parasite and pathogenic microorganism, obviously reducing fish disease. 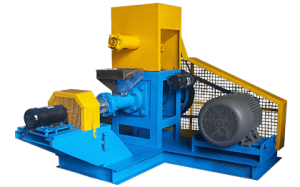 Pelleting is to process the mixture of feed ingredients under high temperature, moisture and high pressure within fish feed pellet mill – raw materials are pressed through die mold. According to lots of experience, too little or too much steam and heat added to the ingredients would produce pellet with poor quality while insufficient temperature and uneven mixing could not kill the dangerous pathogenic micro-organisms existing in feed pellets. 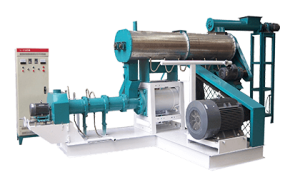 The path to the perfect fish feed pellet requires top processing technology and advanced pellet mill and fish feed extruder. In partnership with the feed industry FANWAY continually strives for pelleting process technology and machine so as to improve the feed conversion rates and nutrition of fish feed. Now let’s discuss the detailed processing of making fish feed pellets. 2.Mixing: the daily feeding amount of fish is small, hence, feed ingredients should be mixed uniformly after grinding process in order to make sure fish can get complete nutrition from daily feed. The mixing degree of blender is very important in feed production processing because it can influence the quality of fish feed, so choosing a suitable mixing machine is quite significant. Here, we recommend well-designed fish feed mixer 500 for equably blending powder or particle materials with good flow ability. 3.Pelleting: if fish farmers want to produce feed pellet that hits precise quality targets in terms of size, durability, density and nutritional composition, they should choose suitable pelleting machine according to their investment cost, production scale, and feeding characteristics and habits of different aquatic animals. Our pellet mill is able to produce high quality feed pellets for fish and also for pets like dog and cat. Moreover, it is not hard to produce feed pellets with different diameters (usually from 0.9mm to 15mm), just changing the size of pellet mill die mold, which gives fish farmers more flexible choice according to fish type and growth situation. Ø Fish feed formulation: fish have their own characteristics at nutrient requirement for feed, for instance, fish can make the most of protein and fat in feed, but cannot absorb carbohydrate very well, and it is hard for fish to digest cellulose. Moreover, fish with different feeding habits have various needs on nutrient. So it is necessary to make scientific and nutritional formulation according to various fish growing demands. Only the nutrients in feed pellets consistent with fish needs can promote digestion and absorption and lower feed coefficient. Ø Quality of feed ingredients: if the types, origin, grade, foreign matter content and storage conditions of feed ingredients are different, the difference of nutritional component will be large. Thus, feed ingredients have a direct effect on the nutrient composition and quality of fish feed pellets. Raw materials with good quality and high grade can be made into feed pellets achieving the perfect nutrition level, while the reverse is also true. In particular, the storing time of feed raw materials can greatly influence the nutrition of fish feed pellets. Ø Processing technology of feed pellets: the particularity of fish feed has higher requirement on the processing technology, and the main indexes affecting processing quality contain grinding particle sizes, steam pressure of tempering and temperature. The thin particle size of raw material means the large surface area, which can acquire better tempering effect. The high curing degree and full gelatinization lead to pellets with good cohesiveness that is not easy to loose after entering water, all of which make feed pellets easier to digest and absorb. In general, there are lots of raw materials for making fish feed pellets – from grains to wood and straw, such as corn, bean pulp, straw meal, soybean, peanut cake, rice bran, wheat bran and so forth. Except for producing fish feed, pelleting process also can be applied to produce animal feed(such as livestock and poultry feed), organic fertilizer pellets (with flat die pellet mill) and biomass industries.